Project Description: Grafix Demo in a Box 2 is an educational technique on using both sides of Wet Media Dura-Lar Film. Golden Acrylic Fluid Paint- 1 fl. oz. 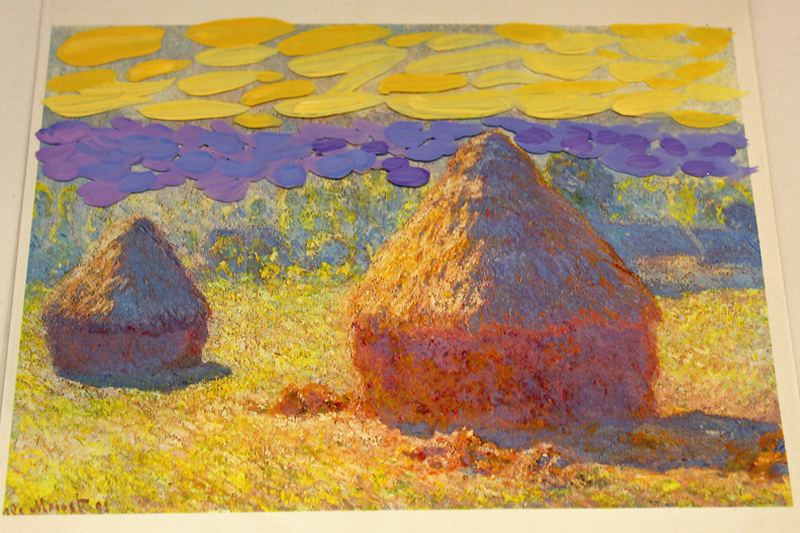 Tape the color copy of the Haystack painting to the chipboard. Then tape the first sheet of Dura-Lar Film on top of the copy so you are able to flip the film back and forth. First Film: Put a nickel size drop of Titanium White and Naples Yellow on the palette in separate areas. Mix about 60-70% white to 30-40% yellow. This gives a nice soft yellow and using a no. 8 brush, paint short strokes over the sky area. Vary the colors by adding a bit more white to the mix, then add a bit more yellow. Demo Tip: Paint down to the edge of the hills. This should look nice and loose, many strokes that fill the sky area with a variety of shades of the yellow. Mist the palette sheet to keep paint moist, as needed. 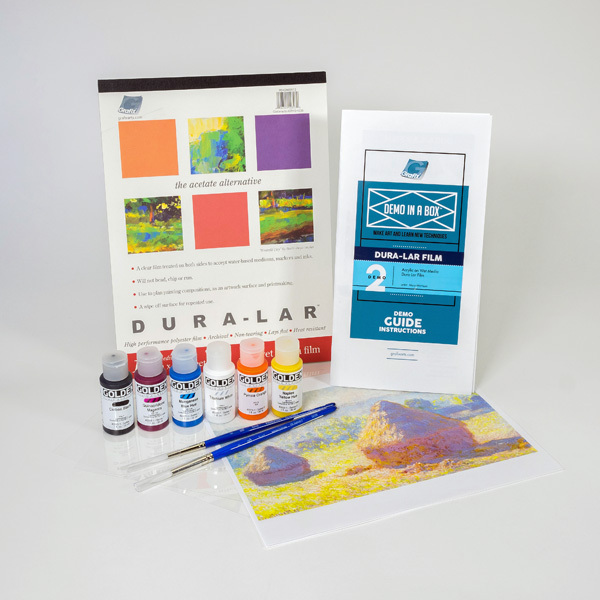 First Film: Next paint in the hills by using a nickel size of Manganese Blue, more white, and Quinacridone Magenta, well-spaced on the palette to allow for mixing colors. For the hills, add a small bit of blue then mix and add a small bit of the magenta to move toward lavender. Using the smaller no. 6 brush paint small strokes like you see in the Monet. First Film: For the trees and brushes, we will use various greens. Mix the yellow, blue and white. Mix 2 different greens one light, with more white and one that’s darker. Use a no. 6 brush build up the green areas following the Monet fashion. 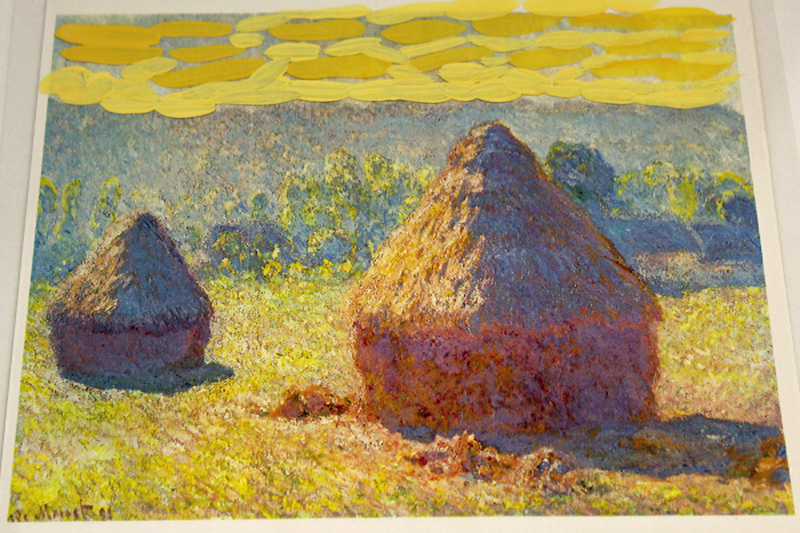 Paint around the haystacks. 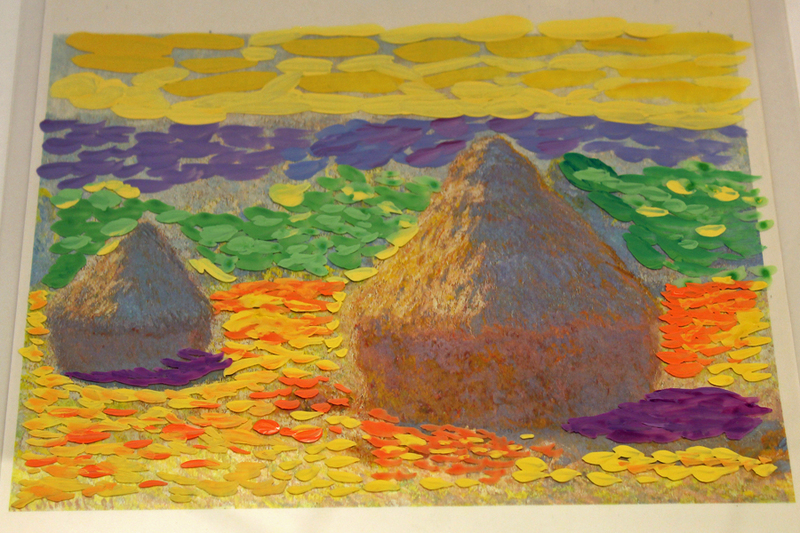 First Film: Paint the field around the haystacks. Squeeze onto a clean palette sheet yellow, white, and Pyrrole Orange with room between each color for mixtures. I like to have about 3 mixtures that I can go back and forth to create the field. White with orange makes coral. Yellow, white and a bit of blue for soft green Mix a grayish violet for the shadows under the haystacks, using blue, magenta, a bit of white and a touch of black. 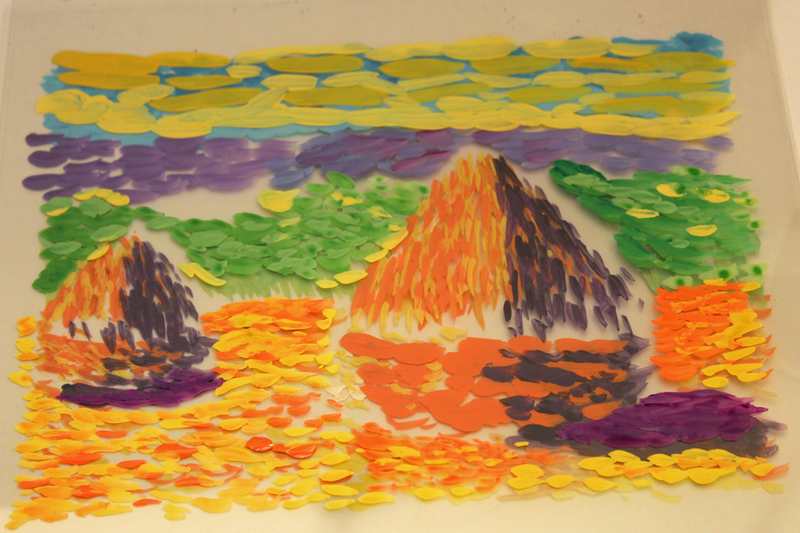 Demo Tip: Have fun; just paint small brush strokes in warm colors, but lightly like Monet. Second Film: After the first film is completely dry, tape the next clear film on the bottom edge over the other layers. 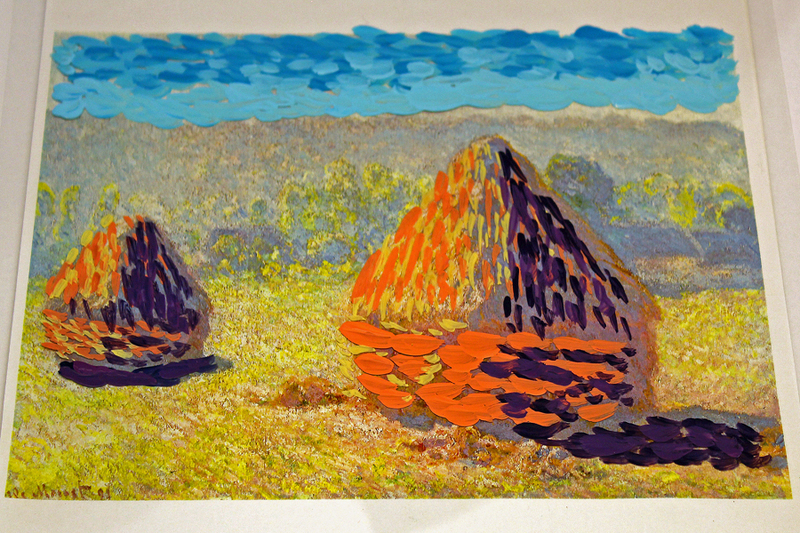 Paint the haystacks with 3 colors: yellow on left (sunny side) magenta and yellow in the center and violet (blue and magenta with a bit of black) for the right, shadow side. Mix these colors and paint starting with the shadow side and ending with the yellows on the sun side. Sky & Shadow: For light blue sky use white and add in a small amount of blue for the color you like. Paint with short brush strokes. Leave some open spaces so the yellow from the first film shows, a bit of black for a darker violet and darker strokes. White with yellow and blue to make a light green. Add these highlights to the haystacks and field area. We can also adjust colors, perhaps adding in a few softer lavender tones to the shadow areas.